European Tour Golf Actives study | Sports Marketing Surveys Inc. The European Tour commissioned market leading sports research company SPORTS MARKETING SURVEYS INC. to undertake an innovative investigation into the UK’s involvement in any form of golf to measure the ‘Golf Actives’. Traditionally, golf’s participation measurement has been based on the number of individuals participating in the sport through playing on a full length golf course. This new research conducted by SPORTS MARKETING SURVEYS INC. extends its boundaries to include elements such as visiting the driving range, a golf simulator, putting greens and playing on a 9 hole course. The research also counts more non-traditional versions of the game such as adventure golf, and playing golf computer games. 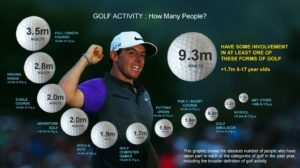 When looking at these Golf Actives, the sport sees 9.3 million adults and 1.7 million children having some form of involvement with golf; a total of 11 million participants in the UK. 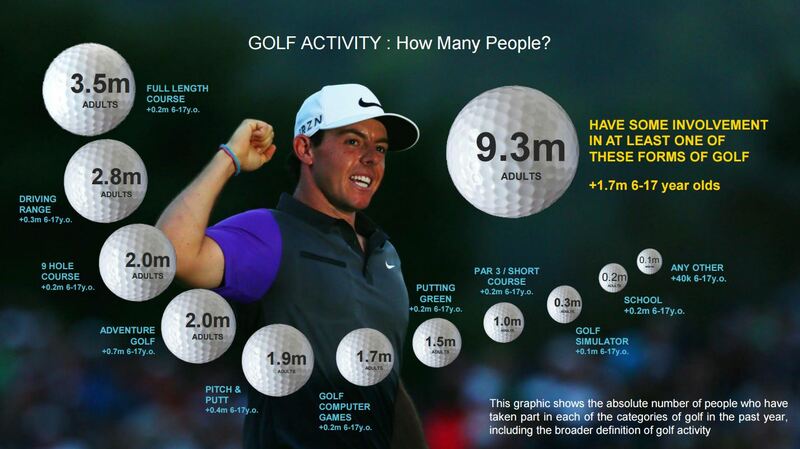 Those playing on a full length course – the traditional barometer – accounts for 3.5M of these Golf Actives. Using the broader participation definition, just over a fifth of the UK population had engaged with some form of golf over the last 12 months. For adults the most popular forms of golf were played on full length courses and driving ranges, while children were most likely to have been to adventure golf. The appeal of the sport is significantly broader than traditionally reported, and sees a much wider demographic of the game with many more women and younger people being well represented. These new formats that have been incorporated into the Golf Active number are more accessible versions of the game and allow more golf exposure in everyday life. They act as a stimulus to trial, can be completed very quickly, would invariably cost less – but still lead to the Golf Actives being able to embrace the full length course game of golf. The research consisted of SPORTS MARKETING SURVEYS INC. conducting 10,050 interviews throughout June/July 2015 to gain a nationally representative sample to study.